I’ve been fighting with the Federal Energy Regulatory Commission (FERC) for years now. Most of the time, they seem pretty monolithic: in all the years they’ve existed, they’ve only said no to two (2) pipeline applications. And they’ve always steadfastly refused to acknowledge the damage that fracked gas does to our climate. Just a few days ago, the two (minority) Democratic commissioners, Richard Glick and Cheryl LaFleur, voted to void the FERC permit for the Mountain Valley Pipeline. There have also been news reports that the two Democrats are demanding a more thorough review of climate impacts – including one time LaFleur took it upon herself to just “do the math” without her Republican colleagues’ permission. Without question the unrelenting pressure of our movement has had much to do with this, and we need to keep it up. FERC is still accepting public comments on their pipeline review process. 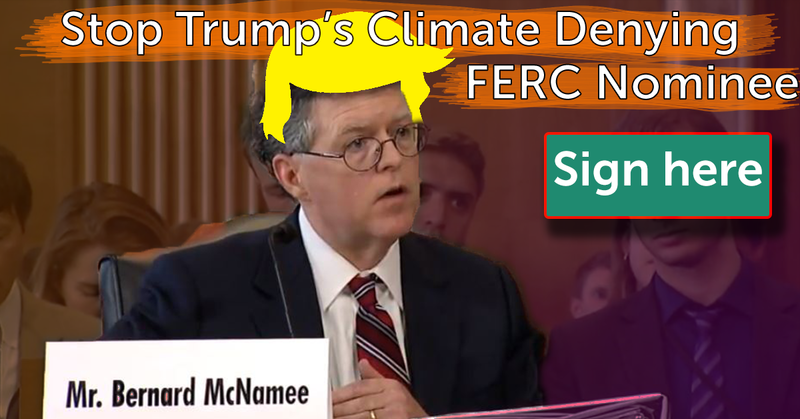 And on Monday June 25, we’re going to deliver a big, noisy message to FERC’s front door. Can you support us? You can join me and our BXE friends in DC to take action on Monday, OR you can just sign this petition and we’ll deliver your name along with thousands of others on Monday. While there have been several dissents from the Democrats over the last nine months since a quorum was restored to FERC, they have not been enough to actually stop any pipeline or permit. And Republican Chairman Kevin McIntyre has made it plain he’s more interested in ‘streamlining’ the approval process than raising new questions or rejecting pipeline applications. But while we’re not yet on pace to truly reform or “fix” FERC, I do think there’s reason to be optimistic in this moment. The recent comments from Glick and LaFleur show that our pressure has changed some minds already. And we know from past experience that when we show up in force to shut FERC down, commissioners often scurry for the exits, or even retire altogether. If we can force one more commissioner to change their position, or step down and replace them with someone who takes climate change seriously, we’ll have a majority. And THAT is worth fighting for. PS – Monday’s action will be big, bold, beutifle and memorable. BXE has already laid out thousands of dollar to build art and props, provide food and housing for all of the participants (including me!) and many other logistics. If you can’t make it on Monday, but want to support the action or watch along online, I know they’d also appreciate a donation – anything helps, but a gift of $1.98, $19.80, or $198 is especially nice and let’s them know you’re with us. Thanks. So this weekend, I’ll be joining our friends from NC APPPL again in North Carolina for a “Walk Between the Creeks”. 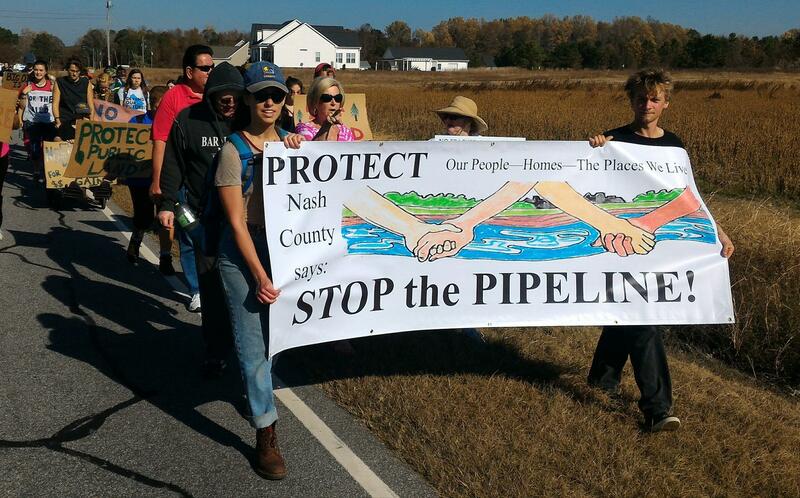 Together, we’ll walk the distance between these two creeks that the Governor’s father loved, and we’ll hold a short ceremony at the mid point with prayer, a water ceremony, and testimony from Nash County residents directly impacted by the pipeline. We’ve invited Governor Cooper, his Secretary of Environmental Quality, and other officials to join us. We hope that the visit and these simple, moral actions will remind the Governor what makes his family home and its waters worth protecting. But even if he doesn’t attend, we know you’ll help us share the story and bring the sacred water we gather to Raleigh on June 21st for an interfaith day of action on clean energy and the Atlantic Coast Pipeline. Together we will Stop The Pipeline. IF YOU CAN JOIN US: The total distance is less than 2.5 miles and we will finish by 1pm whereupon we’ll return to the Dean School for lunch. Shuttles are available back to your car. 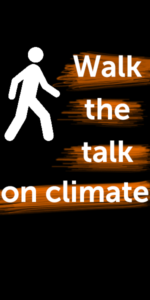 Please bring a bag lunch and appropriate clothes and shoes for road walking. Also, please bring a small jar of water from a spring, creek, or river near your home for the water ceremony. Last week before comments go BOEM! I recorded a short video to explain what we’ve been doing for the last 50+ days as part of the comment on the Bureau of Ocean Energy management (BOEM) comment period on the Trump administration’s proposal to open more than 90% of US Coastal waters to offshore oil and gas drilling. I wanted to explain what we’ve been doing for two reasons: the first is that there’s still time to submit a comment to BOEM (before March 9, 2018), and we’ve got a new way for you to do it that ensures you comment gets heard when you submit it through this super cool new action portal we set up with friends. The second reason is that this is a really great example of the kind of work 198 methods does, how we’re different from other environmental groups, and why it matters. Early this year, Ryan Zinke, Trump’s Interior Secretary, announced a new plan that would open more than 90% of US coastal waters to oil and gas drilling. It’s a really really bad plan, since offshore oil drilling always leads to more spills and accidents.And if anything, Trump’s other actions to roll back protections for the environment and worker safety will make accidents even MORE likely. Plus, there’s simply no way to manage the decline of fossil fuels and create the 100% renewable powered economy we need to stop climate change if we open up millions of new acres to offshore drilling. Which is why the Obama administration just banned all drilling off the Atlantic and pacific coasts 2 years ago after a HUGE public comment period in which more than 3 million people, dozens of governors, hundreds of mayors and just about everyone who lives along the coast clearly said #NoDrilling. Loads more footnotes and references in this pst from early in the comment period. As usual for this White House, the rollout was chaotic and ham-handed, and the whole thing may not even be legal because Zinke tried to exempt just the state of Florida as an explicit political favor to Governor Rick Scott who wants to run for US Senate. More on that later. BOEM is required by law to hold a 60 day public comment period on any new offshore drilling plan like this. But it was clear from the rollout, and from Zinke & Trump’s past actions, that they weren’t going to be talked out of drilling just because a majority of Americans oppose it. Which brings us to the first part of our plan: We didn’t just want you to comment online – though more than 14,000 of you did, and that’s awesome – we wanted to deliver the comments through direct action speak outs at the hearings, and that’s just what we did. Drew got up on a chair and shouted down the Columbia SC BOEM hearing, earning him a mention in the Washington Post. We did a similar action a few weeks later in Raleigh NC with friends from NC APPPL, who we’ve been working with to fight the pipeline. 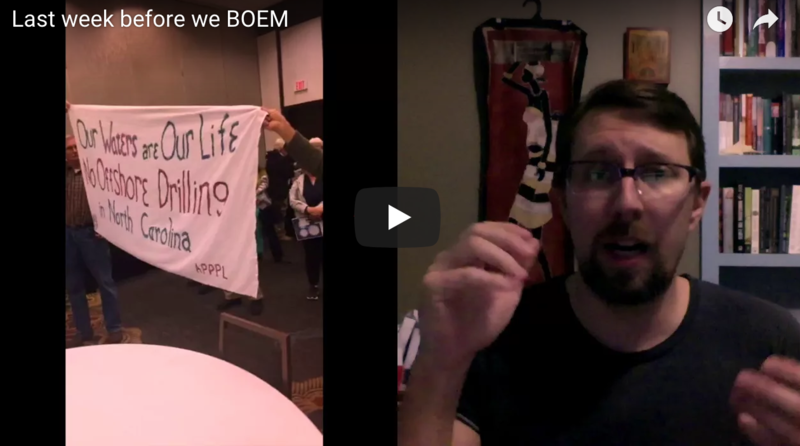 And once it got going, we weren’t alone: There were public disruptions and refusals to play along with BOEM’s process at hearings in Washington DC, New Jersey, and lots of other places. 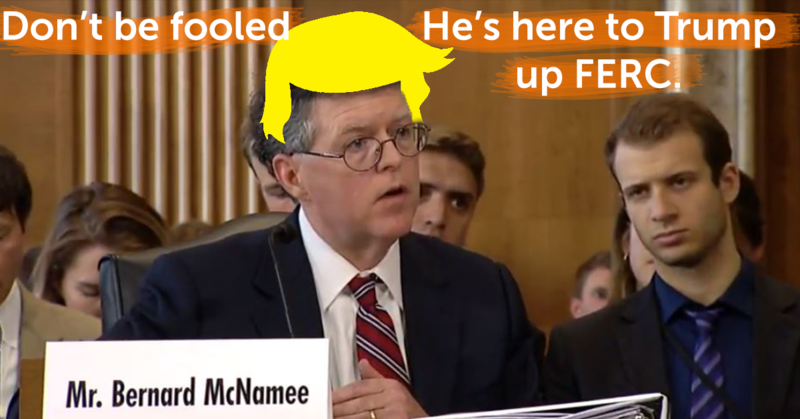 One of my favorite’s was the action in Rhode Island where our friend and frequent ally Tim DeChristopher, succeeded in turning the whole hearing on its head with citizen after citizen getting on a literal soap-box to speak out about offshore drilling and (eventually) dragging the BOEM staff into a debate on the issues. All of which brings me back to why I wanted 198 to work on offshore drilling plan in the first place, and how your actions with us really make a difference: First – It’s about an important concept in Gene Sharp’s writings and teachings called ‘withholding consent’. When we fight climate change, we’re fighting a really BIG system. It involves money and power at a lot of different levels. Fundamentally, it’s also an autocratic system – meaning it’s accountable to a ruling elite, not to the people or the planet. At 198 methods, we’re convinced that fighting climate change requires a specifically anti-authoritarian approach. 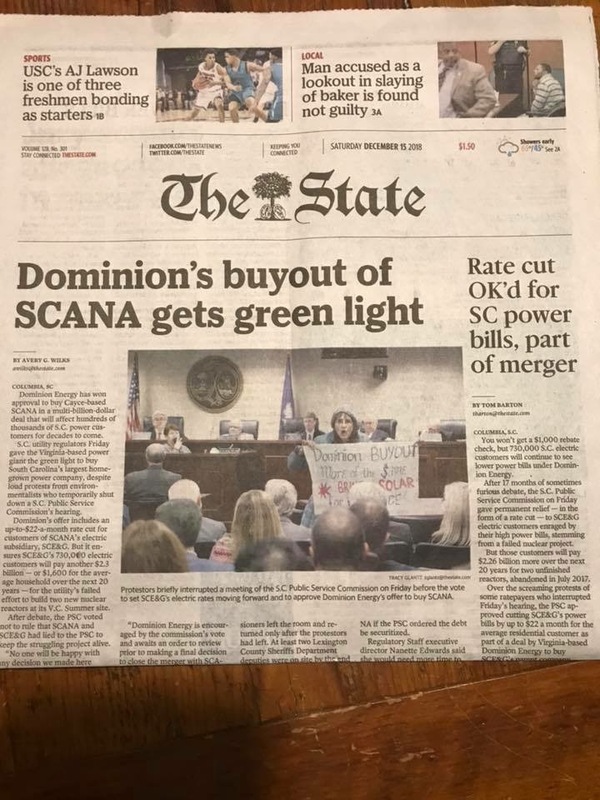 Like what we did at the BOEM hearings: by standing up speaking out in ways that BOEM didn’t condone (and threatened to throw us out or shut down the hearings over) we put the staff of this administrative agency in a bind. We’re asking them to consciously choose NOT to do their jobs, if that’s what it takes, in order to stop the greater harms of offshore drilling. We’re demonstrating, in a really physical, in-your-face way, that there will be a reckoning — we know most of the people are commenting in opposition to offshore drilling. We know that the consequences of this offshore drilling plan will threaten us all through climate chaos, oil spills and more. And we’re asking them to pick a side: with us or with the polluters. 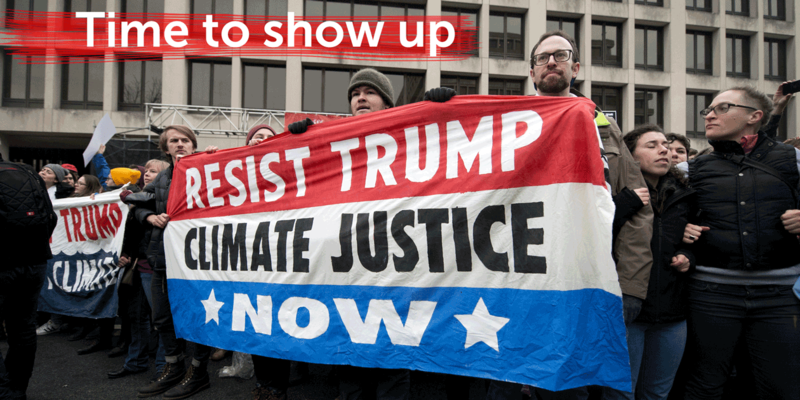 Second – It’s about inspiring people who are already part of the process to realize they have more power than just typing a comment into a laptop — including our allies in groups like the Sierra Club and Oceana that did not support our efforts to stand up and disrupt the hearings in advance. I noted after the SC hearing that I saw a lot of groups advocating a sort of NIMBY (Not In My backyard) strategy. Basically, they were trying to convince BOEM to give them the same exemption Zinke gave Florida (which, again, may not hold up in court). They did this either through explicit argument, like by siting the value of their coastal tourism economies, for example; Or through an implicitly political argument, like by having lots of Republicans or state-wide officials testify that they are opposed to drilling, which helps make the argument that Trump & Co. will lose support in the mid-term elections if they push forward with the plan. But I think that’s the wrong approach for two reasons: one, as outlined below, it fails to move the media narrative and focusses attention on our weakest and least reliable partners. More importantly, it uses a NIMBY argument when what we need is a NIABY argument – Not in ANYBODY’s Back Yard. We don’t just want to ban offshore drilling in South Carolina, or California, or in places that have Republican Governor’s, or in places with coastal tourism: We want to ban offshore drilling – ALL of it – because it’s way to dangerous for our communities and our planet. Third – It’s about inspiring everyone who’s not part of the process yet. Two years ago, more than 3 million people and hundreds of academics, researchers, churches, and all kinds of organizations commented in opposition to offshore drilling (all of it). Obama responded by banning drilling off the Atlantic and mainland US Pacific coasts, but allowed it to continue in the “sacrifice zones” of the Gulf of Mexico and much of Alaska. That was basically what the conventional wisdom in the media expected, and so it was ‘enough’ to turn out lots and lots of comments so that Obama would feel empowered to do that. But there is no conventional wisdom for what Trump is doing. He’s already given away more land to fossil fuels, and more brazenly, than anyone imagined a few years ago. And, dazzled by the sheer, crazy, deluge of horribleness, the main stream media (like that Washington post story) default to covering this as a ‘normal’ political story where there are people for drilling, and people against it, and BOEM is a sort of neutral mediator. To stop Trump and team’s plan we need to be bigger, more powerful, and reach more people. That means working outside of the conventional wisdom of what works in the media and political wisdom. We can’t wait for Trump to come to his senses, or be satisfied with incremental NIIMBY victories any longer. Honestly, it will probably mean more of us lining up on roads and paddling our kayaks in front of drilling rigs to stop them. That’s movement building work – not lobbying and media work. And to inspire people, a LOT of people to rise up against big authoritarian power of the petro-state as represented by this offshore drilling plan, we need to inspire people. And that, fundamentally, is why we do digitally supported direct actions JUST LIKE THIS! Look, there are enough of us, in America, to stop offshore drilling, reverse climate change and build the 100% renewable fossil free world we need. What’s more, we’ll all have more jobs, more money, more political power and more control over our daily lives when we do. What’s holding us back is the raw political power (fueled by money, fear, and a lot of other things) of the fossil fuel industry and their allies in power – like the Trump administration. but to mobilize those people, we need to show them that resistance is possible, that it works, that it feels good (if I can’t dance I don’t want to be in your revolution) and most importantly that they have the power. Glad you asked. First of all, if you liked our actions and the ideas in this post, please chip in to support us. If everybody who sent in a public comment with us gave $1.98, we’d have more than enough money to fund our entire operation for 6 months. Of Course, not everyone can donate, so if you’re in a position to give a little, please consider a weekly donation of $1.98, or a gift of $19.80 to support our ongoing work. 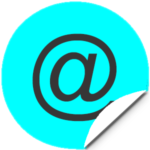 Second – it’s not too late to submit your comment, and even if you already sent one in with us, or with another group, hang on and consider this new tool as well. Working with our friends at Daily Kos and Action Network, we’ve set up a new comment form that delivers your comments directly to the BOEM staff in charge of this docket. I’ll still deliver all the 14,000+ signatures you sent in through the in-person deliveries, and I’ll submit them as evidence before the March 9 deadline. But by also submitting a comment through this new form, you’ll essentially get two comments — and that can be really helpful for when our friends in the legal community go to court to challenge this rule. Being able to cite the fact that there were a LOT of comments, and also to pull out individual voices of opposition from the public record, will be really helpful. So, if you haven’t commented, please do so now. And if you already have, comment again! Earlier this week I endorsed a letter calling on Duke energy to take action on climate change with a bunch of other social and environmental justice nonprofits, singers, actors, and other VIPs. NC Warn, the group that spearheaded the letter, is especially alarmed by a powerful new NASA study linking climate chaos to rapidly rising global methane emissions from the fossil fuel industry. NASA’s findings strengthen arguments that the U.S. fracking boom is linked to record-breaking global heat since 2014, and thus contributing to the acceleration of weather extremes that are devastating communities and wildlife worldwide. North Carolina residents are in a unique position to back us up: Duke CEO Lynn Good is likely to listen to what you say — IF you say it in public and online. 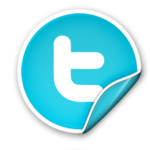 Can you back us up by posting about the letter on Facebook, Twitter or by email? It’s not just us climate activists who are alarmed about that new NASA study: Grammy Award winner Bonnie Raitt also called on Duke CEO Lynn Good to take action — so did Hollywood United, a campaign led by actors like Mark Ruffalo, Leonardo Dicaprio, Norman Lear and many more. But you don’t have to be famous to know that Duke should take action. Communities across North Carolina are already suffering repeated floods, fires, droughts and other climate impacts. And we’ve been taking action with allies who are fighting the massive Atlantic Coast Pipeline (ACP),3 which would bring even more of this climate-wrecking fracked gas *(methane) from West Virginia through North Carolina, and eventually to South Carolina as well. Replace all fossil fuel electricity with renewables bolstered by energy storage, efficiency and energy-balancing programs. This is especially important for Duke energy, since they’re one of the only utilities in the US where greenhouse emissions are rising due to methane venting and leaking from its massive expansion fracked gas. Take action this weekend, and NCWarn will amplify your call in ads and paid outreach this month to and urge Duke CEO Lynn Good to help avert climate chaos instead of making it worse – with a first step being cancellation of the Atlantic Coast Pipeline. Last week the Army Corps of Engineers gave preliminary approval to the Bayou Bridge Pipeline (BBP). 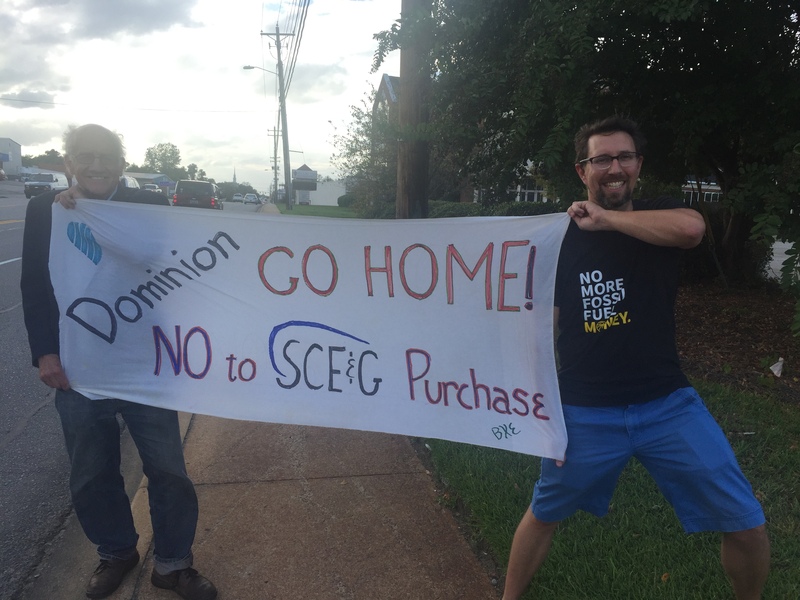 A few days earlier, the Virginia Water Control Board (VaWCB) voted 4-3 to approve the fracked gas Atlantic Coast Pipeline (ACP), but required a final review of several environmental studies. That second one is actually considered a partial victory, since the week before the VaWCB had voted to approve the Mountain Valley Pipeline (MVP) — another, shorter, fracked gas pipeline — with no such condition. This not to mention the FCC ripping apart #NetNeutrality and the Republican Congress poised to ram through a tax bill that will steal our healthcare, deport our neighbors and drop a depth charge on the middle class from a luxury yacht. So, yeah, the last week wasn’t great. 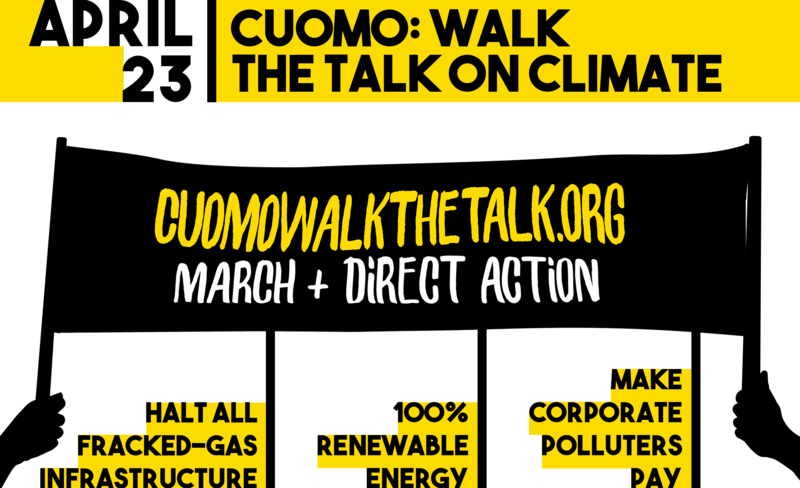 But here’s the thing, in moments of crisis this climate justice movement rises to the occasion in ways that never fail to startle and inspire me. 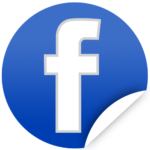 So, short version – Can you chip in to support what we’re doing? Even $1.98 helps a lot, and there’s a ton of other (including non-monetary) stuff you can do to help that we’re supporting or participating in below. Ok – how to help. First, if you haven’t already, you need to sign up to show up. Both the #NoBBP and the #NoKXl movement have launched “pledge to protect” campaigns that encourage you ti sign up to show up – when asked, that’s really important – to support thee campaigned with civil disobedience and direct aid. Can’t/Not sure you can show up in Nebraska, Louisiana or one of the other frontline pipeline fights? 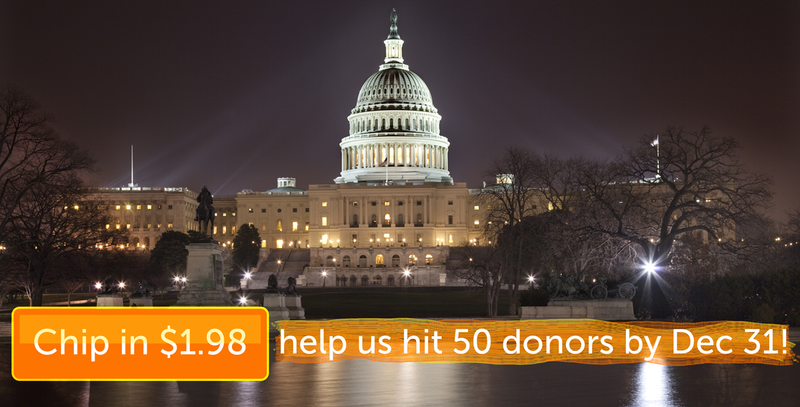 Click here to chip in $1.98 and help us bring the thunder wherever it’s needed. If we stop the pipelines, and lose the economy, our democracy, and all our immigrant neighbors though, it wont count for much. So we also need to sign up to show up and stop congress this week. Some of the best organizing going right now is to stop the tax bill, or derail it by forcing a big fight about the DREAM act. All week long, brave young dreamers, people who rely on the Affordable Care Act have been showing up in force. If you can get to D.C. or a local rally and support them you should. Click here to get connected to a local #DreamActNow protest with OurDream and 198 methods. Click here to join a massive protest at the U.S. Capitol in Washington D.C. on Monday & Tuesday. Travel support is available for a limited number of people, so check it out if you live anywhere from GA to ME on the East Coast. Can’t/Not sure you can get to a rally about the #GOPTaxScam before Wednesday (when votes are likely)? Click here to chip in $1.98 or more and we’ll bring you live feeds, updates and digital support materials for every time zone. Congress votes (in accordance with some 70% of their constituents wishes) to overrule them with a powerful tool called the Congressional Review Act. The CRA gives Congress 60 legislative days to overturn a rule issued by a federal agency with a “resolution of disapproval,” and it is NOT subject to a filibuster, so it can pass the Senate with just 51 votes. Last, I want to talk about California, and all the places recently ravaged by climate-fueled super-storms. The fires, now among the largest in California history, are being driven by strong winds and new evacuation orders were issued in the last 24 hours. One firefighter, Cory Iverson, 32, has been confirmed dead. And like Puerto Rico, we expect the actual toll to be much much worse than the public account. Some friends have been strategizing about Mutual Aid Disaster Relief, and I think there’s potential fir us to help. But to do so we’ll need a lot of logistics. Training, supplies, some sort of micro-grid on wheels. We need to get ready, and the climate chaos isn’t waiting. If you chip in now, we’ll put 100% of the funds towards staging actions, protests and relief efforts where they matter. Even better, 100% of your gift is now tax-deductible as we apply for charitable status from the IRS. But I don’t know what the next few weeks will bring — whether there will be another disaster to respond to, another pipeline permitted, or whether the Trump team will order the IRS to disregard all new applications towards protecting the environment the way they told the CDC to stop using words like “fetus” and “science-based” last week. What I do know is that, together, we can make a difference. But only if we show up however we can. Click any of the links in this email to get connected and show up to say #NoKXL, #NoBBP, #StopGOPTaxScam, clean #DreamActNow, or do stand in solidarity with the victims of #ThomasFire and ALL the #ClimateChanged disasters of the last few months. Or, click here to chip in and help us fight back.